About SiS GO Hydro SiS GO Hydro is designed to ensure you are effectively hydrated to produce your best performance. As an effervescent tablet that readily dissolves in plain water, it represents a highly practical approach without the calories. 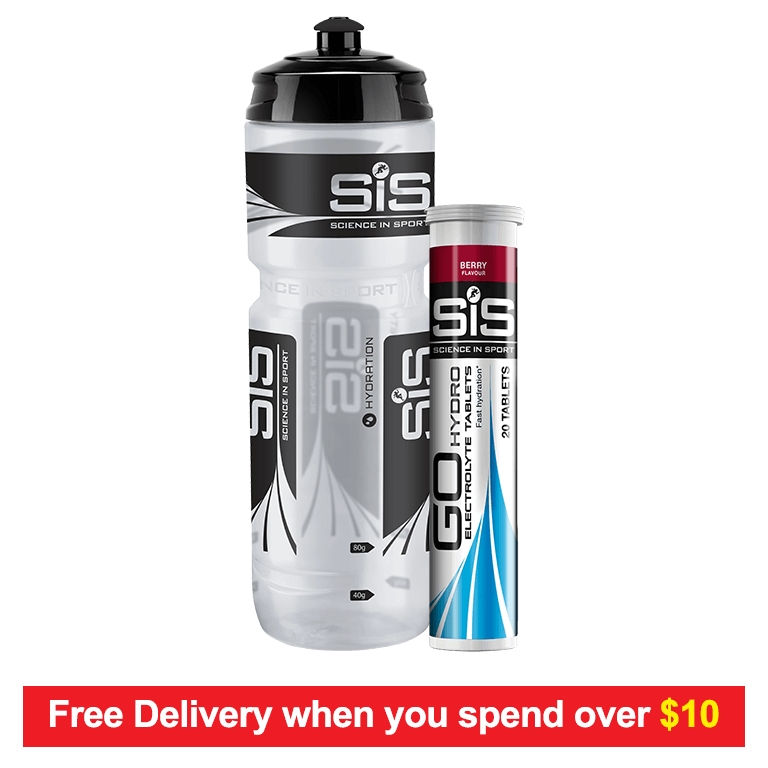 SiS GO Hydro berry meets your sodium requirements at a specific concentration (30mmol/L) that is scientifically proven to produce superior hydration compared with water alone. It was developed to keep the British Sailing team optimally hydrated at the 2008 Beijing Olympics. Simply drop one tablet per 500ml of water for effective hydration, with virtually no calories, before and during sports. Benefits of the SiS GO Hydro During moderate to intense exercise, we can produce up to 2 liters of sweat per hour depending on the environmental conditions. Sweat contains vital electrolytes, including sodium. Sodium is the most important electrolyte as it helps to stimulate thirst, improve taste and promote absorption and retention. If fluid and electrolyte losses are not replaced, dehydration occurs which is a major cause of fatigue. Once dehydrated, our body temperature rises; our heart rate increases; we deplete carbohydrate stores quicker and we perceive the exercise to be more intense. SiS GO Hydro can help prevent this, with the aim not to lose more than 2% of our body mass. Berry flavored electrolyte mix with natural elderberry extract and added sweetener in 20 tablet pack. Directions For Use: Add 1 SiS GO Hydro tablet to 500ml of water and let it dissolve. Once prepared consume within 24 hours. Do not consume more than 4 tablets per day. Recommended Usage: Consume 500ml of SiS GO Hydro 3-4 hours prior to your event with a further 250-500ml in the hours before starting. During exercise of a shorter length where carbohydrate intake is not necessary, consume 500 ml of SiS GO Hydro per hour. If aiming to combine hydration and energy delivery, consume SiS GO Electrolyte with the SiS GO Gel range. Key Features Simply drop in water to provide a high electrolyte drink high in sodium to help promote hydration when hydration is required without the added calories Contents: 20 x 4.3g Tablets Suitable For Vegans. BBE: Minimum 6 Months+ Informed Sport Registered: Our complete product range is developed using a world-class approach to banned substance testing, providing assurance for athletes. For more information on Informed Sport & our unique world class approach, click here.